Add rinsed basmati rice to a pot of cold, salted water. Bring to a boil and let simmer for approx. 5 min., then drain. In the meantime, cut potatoes into thin (approx. 8mm/ 1/3-in.) slices. Add turmeric and saffron to the melted butter and stir to combine. Grease the bottom and sides of a heavy-bottomed pot with some butter. Add half of the butter mixture to the pot. Then add potatoes slices and rice. Use a spoon to press the rice down firmly. Drizzle over the remaining butter mixture and water. Wrap the pot lid with a clean kitchen towel and cover the pot tightly. Let cook over low heat for approx. 45 min. Remove from heat and set for approx. 15 min. more. Uncover and cover the pot with a slightly larger plate. 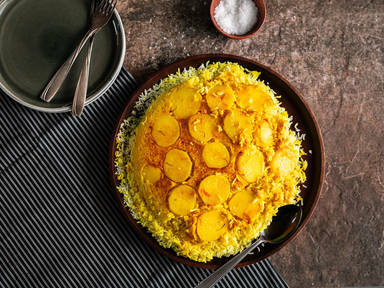 Turn the pot with plate upside down carefully to transfer tahdig to the serving plate. Enjoy!